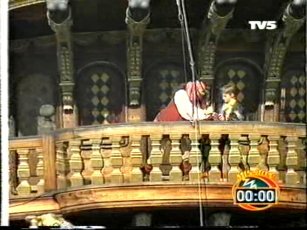 It’s another Adventure Line show, seemingly some sort of reversioning of Les Mondes Fantastiques. 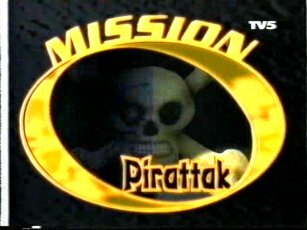 Mission: Pirattak only had one series in 1998, which is a shame in a way. 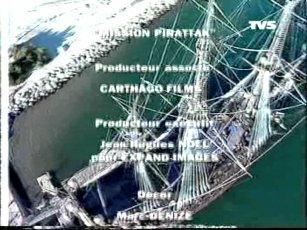 The titles show a band of pirates breaking into somewhere and stealing a load of jewellery. 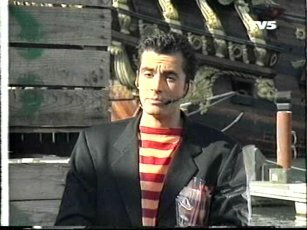 The captain is played by Yann le Gac, of Fort Boyard‘s Pere Fouras fame. He’s not the only connection. Anti-bug seems to be the crime fighting company of choice. Here is their Mystery Machine. 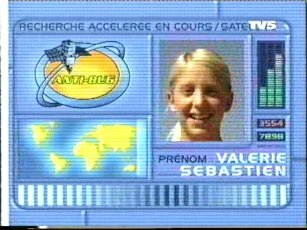 The onboard computer spins round its list of agents, selects three, and prints out some ID cards. 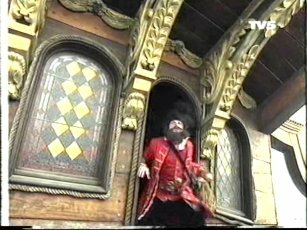 Here’s our host Oliver Minne, also of Les Mondes Fantastiques, Fort Boyard and La Cible fame. Here are our three agents. Two of them will be performing tasks on the boat, the third will be helping to co-ordinate everything from the van. Here is the view from the van’s onboard computer. As you can see, the others are getting a lift to the pirate ship on a jetski. The two contestants out in the field will enter the ship through a hole in the side (bottom middle of the picture). First job. There are three doors to get to the next area, but two of them are trapped. The person in the van can tell the team which door is the safe door. 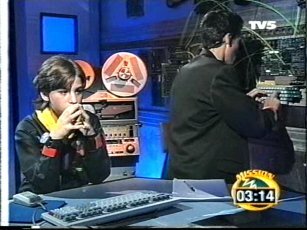 After unlocking it using some sort of transmitting device, the team have twenty minutes to complete the challenges and get as much swag back as possible. After crawling through some nets, the next challenge is to find three skulls. One team member crawls underneath the wire mesh, the other one clambers on top pulling up slats which block the route. The third member directs the caged person to the places with the skulls. Skulls found, it’s now time to go to the main hold of the ship. But what about the pirates? Well the obvious answer is to drug them using the ship’s ventilation system. A small explosion later, and now all the pirates have briefly turned “good”. It’s time to enter! We have no idea what this talking skull pirate thing (also voiced by Yann le Gac) is. But he instructs the contestants during this section. There are three challenges, each one begins by feeding one of the skulls down a hole. Each challenge is timed by a tube of lights that makes up it’s ribcage. When the lights all go out, the time has ran out. Successful completion of a challenge yields a coin. This is scanned, and back at base a clue is revealed. 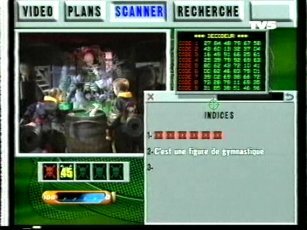 For the first game, one contestant has to follow the red eyed mechanical pirate who will sing a song. He will stop at the end of each couplet, at that point, the contestant has to correctly guess which of the three words finishes the couplet off. 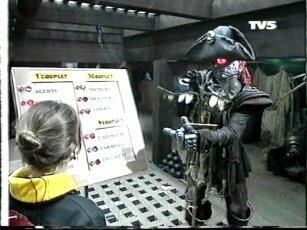 If she selects the wrong answer, the pirate will repeat the same lines until she gets it correct. She fails. 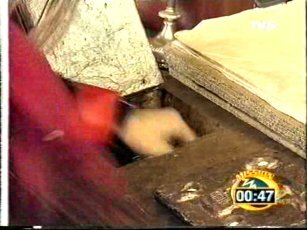 The second task is a treasure hunt of sorts. There are six different types of vegetation down the left, and the numbers 1-6 along the top. These all act as co-ordinates. Under each lid is an instruction which leads to another lid. The person in the van can help out with his pictorial list of spices. And here’s the results of the scanning. The number 45 and a clue. It’s now time to guess the codeword, and they’ve got to do it before the gas wears off. 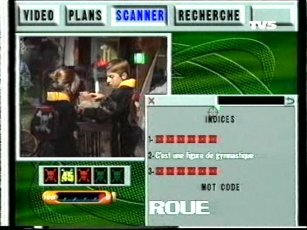 The agents on the ship put the receiver thing into a slot whilst the person in the van transmits the codeword. And they’re right! They can quickly use the stairs to get above deck. Had they failed, they would have been thrown into prison and would have to be busted out by what seems to be a double agent on the ship. This wastes time. This pirate here leads the challenges on the deck. We’re completely unsure as to the whys and wherefores of this and why he doesn’t just run the agents through. 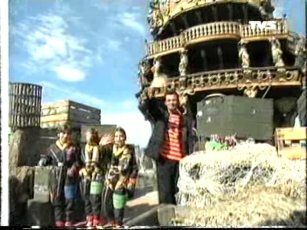 Antoine, the stunt bloke from Fort Boyard, seems to be some sort of double agent and is on the kids’ side. The challenges on the deck are rather more physical. For this first challenge, the male contestant has to get some sort of cup thing that’s manacled to the rope off of the rope by moving it along to the end. 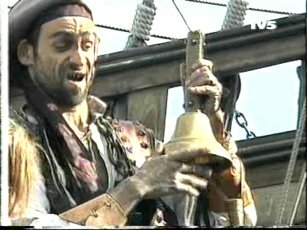 The pirate rings his bell to start the game, and rings it again to signify time running out. Luckily, our contestant manages to get the cup thing off the rope before time runs out. 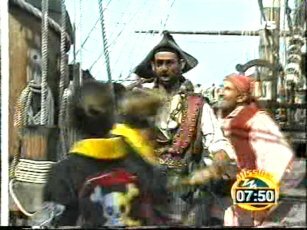 The pirate gives him another coin. 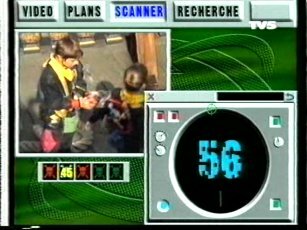 Which after a quick scan reveals the number 56. What could it mean? The final challenge. The girl is hoisted up to the crow’s nest. Once up there, she must negotiate a rope bridge and pull up another rope to retrieve the coin. She’s then lowered back down to the ground. Scanning the coin is an excuse for Minne to look like he’s doing something vaguely espionage-y. Tapping away on a keyboard, here. Time running out, it’s now time to go to the captain’s room and try to claim some of the jewellery back. But first they must climb across the cornice here. 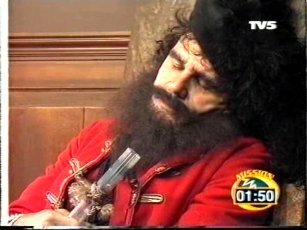 The sleeping captain. The contestants must try not to wake him. He’ll mysteriously wake up when the time runs out, and he’ll do his “troubled dreaming” acting thing when the contestants come near. The first job is to open the book. This is done by sliding the transmitter/receiver thing into the lock and having the van’s computer open it. To open the containers with the gold, the team must press buttons on skulls and pull a candlestick. 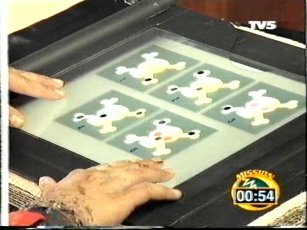 To find out which buttons to push, they first have to get the acetate overlay whcih the captain is holding in the above picture. 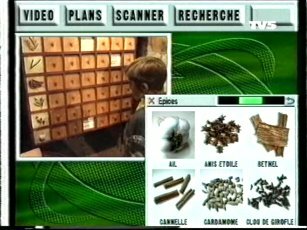 We originally thought the numbers found on the coins were sequences to opening the cases. However, seeing as one of them is 56, and there’s no “6” combination on the sheet, we’ve come to the conclusion that these are numbers transmitted to the lock which will allow one door to open for each coin that they earnt. There are five doors, each with jewels behind. 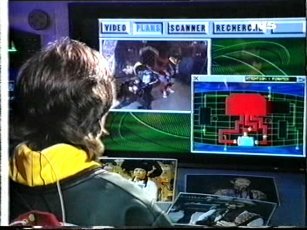 Therefore, to open door 1, one contestant must push the button on the bottom left of the skull whilst the partner pulls the candlestick. Like so. The kid can grab a handful of jewels and stuff them into a bag. The computer will warn the team that time is getting low. It will get gradually more excited and implorable the longer the contestants stay in the room. And now it’s time to escape the ship! 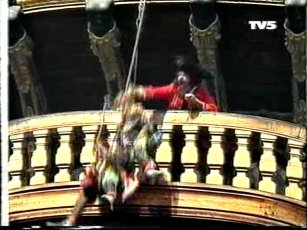 They run out of the captain’s room to the friendly pirate who hooks them up to a zip line. Here comes the captain, and he’s angry! But they’ve jumped off just in time. Phew! The pirate captain throttles the other pirate bloke, for obvious reasons. Minne congratulates the team and takes the jewels. And let’s have a look at what you’ve won. 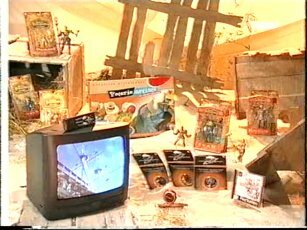 Three sets of jewels earns you a 20 inch television, a subscription to a TV mag, some action figures, some sort of modelling kit and a PS One game. Wooh! 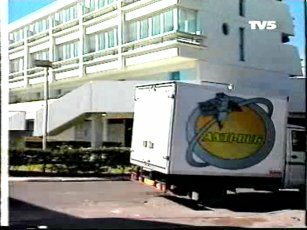 If you’re interested, the show was filmed in the town of La Grau de Roi, which is near Nimes in the south of France. 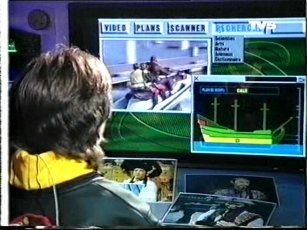 The final rush bit in CITV gem Get Wet springs to mind. Must be the pirate ship. It does look quite entertaining but I can see why it only lasted one series. 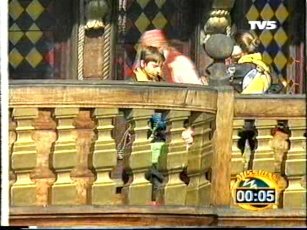 It would start to look contrived and next to Boyard it looks quite cheap really. 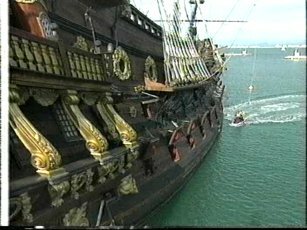 Cheap is a bit unfair – the ship set is actually quite lavish, perhaps I should have got this across more. It reminds me of The Desert Forges really, nice set, some interesting games but rather too many holes in the feel of it to ultimately be successful. I had a lot of fun watching this and have to say that it really rocked ! 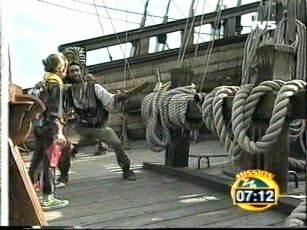 I played the role of the british pirate in this series. The kids loved it and got really involved in the games. 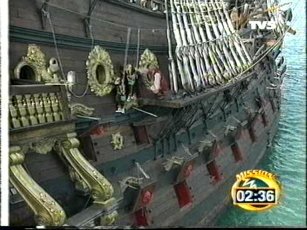 The ship is the same one used in the Polanski film ‘pirates’. We had great fun making the series and did all the episodes for the year in about 3 weeks making 3 to four episodes per day. Hey Gead, that’s amazing! I had no idea there was a British pirate! I’ll have to rewatch the episodes I’ve got. Thanks for dropping by! Hey, thanks for the article and pictures. By any chance, do you have any link to see one of the emissions? 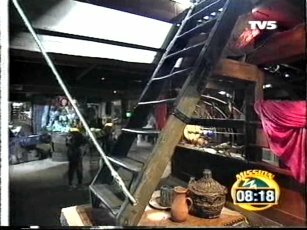 I used to watch the show, it as just awesome. Thanks for the memories, man!